Why Do Many Reconsideration Requests Fail? There are several reasons a reconsideration request might fail. But some of the most common mistakes site owners and inexperienced SEOs make when trying to lift a link-related Google penalty are entirely avoidable. Here are some of the most common mistakes made when submitting reconsideration requests, and how you can prevent them. This is one of the most common reasons why reconsideration requests fail. 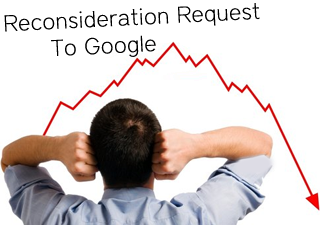 This mistake is readily evident each time a reconsideration request gets rejected and the example URLs provided by Google are unknown to the webmaster. Relying only on Webmaster Tools data isn’t enough, as Google has repeatedly said. You need to combine data from as many different sources as possible. The more you know about a site’s history and past activities, the better. You need to find out (a) which pages were targeted in the past as part of link building campaigns, (b) which keywords were the primary focus and (c) the link building tactics that were scaled (or abused) most frequently. Knowing enough about a site's past activities, before it was penalized, can help you home in on the actual causes of the penalty. Also, collect as much information as possible from the site owners. Misreading your current situation can lead to wrong decisions. One common mistake is to treat the example URLs provided by Google as gospel and try to identify only links with the same patterns. Google provides a very small number of examples of unnatural links. Often, these examples are the most obvious and straightforward ones. However, you should look beyond these examples to fully address the issues and take the necessary actions against all types of unnatural links. Another common area of bad judgement is the inability to correctly identify unnatural links. This is a skill that requires years of experience in link auditing, as well as link building. Removing the wrong links won't lift the penalty, and may also result in further ranking drops and loss of traffic. You must remove the right links. There are numerous unnatural link-detection tools available on the market, and over the years I've had the chance to try out most (if not all) of them. Because (and without any exception) I’ve found them all very ineffective and inaccurate, I do not rely on any such tools for my day-to-day work. In some cases, a lot of the reported "high risk" links were 100% natural links, and in others, numerous toxic links were completely missed. If you have to manually review all the links to discover the unnatural ones, ensuring you don't accidentally remove any natural ones, it makes no sense to pay for tools. If you solely rely on automated tools to identify the unnatural links, you will need a miracle for your reconsideration request to be successful. The only tool you really need is a powerful backlink crawler that can accurately report the current link status of each URL you have collected. You should then manually review all currently active links and decide which ones to remove. I could write an entire book on the numerous flaws and bugs I have come across each time I've tried some of the most popular link auditing tools. A lot of these issues can be detrimental to the outcome of the reconsideration request. I have seen many reconsiderations request fail because of this. If Google cannot algorithmically identify all unnatural links and must operate entire teams of humans to review the sites (and their links), you shouldn't trust a $99/month service to identify the unnatural links. If you have an in-depth understanding of Google's link schemes, you can build your own process to prioritize which links are more likely to be unnatural, as I described in this post (see sections 7 & 8). In an ideal world, you should manually review every single link pointing to your site. Where this isn’t possible (e.g., when dealing with an enormous numbers of links or resources are unavailable), you should at least focus on the links that have the more "unnatural" signals and manually review them. When trying to lift a link-related penalty, you need to look into all the links that may be pointing to your site directly or indirectly. Such checks include reviewing all links pointing to other sites that have been redirected to your site, legacy URLs with external inbound links that have been internally redirected owned, and third-party sites that include cross-domain canonicals to your site. For sites that used to buy and redirect domains in order increase their rankings, the quickest solution is to get rid of the redirects. Both Majestic SEO and Ahrefs report redirects, but some manual digging usually reveals a lot more. All major link intelligence tools, including Majestic SEO, Ahrefs and Open Site Explorer, report only the first link pointing to a given site when crawling a page. This means that, if you overly rely on automated tools to identify links with commercial keywords, the vast majority of them will only take into consideration the first link they discover on a page. If a page on the web links just once to your site, this is not big deal. But if there are multiple links, the tools will miss all but the first one. For example, if a page has five different links pointing to your site, and the first one includes a branded anchor text, these tools will just report the first link. Most of the link-auditing tools will in turn evaluate the link as "natural" and completely miss the other four links, some of which may contain manipulative anchor text. The more links that get missed this way the more likely your reconsideration request will fail. Many SEOs and webmasters (still) feel uncomfortable with the idea of losing links. They cannot accept the idea of links that once helped their rankings are now being devalued, and must be removed. There is no point trying to save "authoritative", unnatural links out of fear of losing rankings. If the main objective is to lift the penalty, then all unnatural links need to be removed. Often, in the first reconsideration request, SEOs and site owners tend to go too thin, and in the subsequent attempts start cutting deeper. If you are already aware of the unnatural links pointing to your site, try to get rid of them from the very beginning. I have seen examples of unnatural links provided by Google on PR 9/DA 98 sites. Metrics do not matter when it comes to lifting a penalty. If a link is manipulative, it has to go. In any case, Google’s decision won’t be based only on the number of links that have been removed. Most important in the search giant's eyes are the quality of links still pointing to your site. If the remaining links are largely of low quality, the reconsideration request will almost certainly fail.